Records: Florida National (12-1-0), St. Thomas University (4-6-2). The Florida National Conquistadors controlled the ball and kept the control of the match. The Conquistadors took the lead in only the 21st minute of the match with an amazing goal scored by Maximiliano Schenfeld to claim a 1-0 lead over STU. 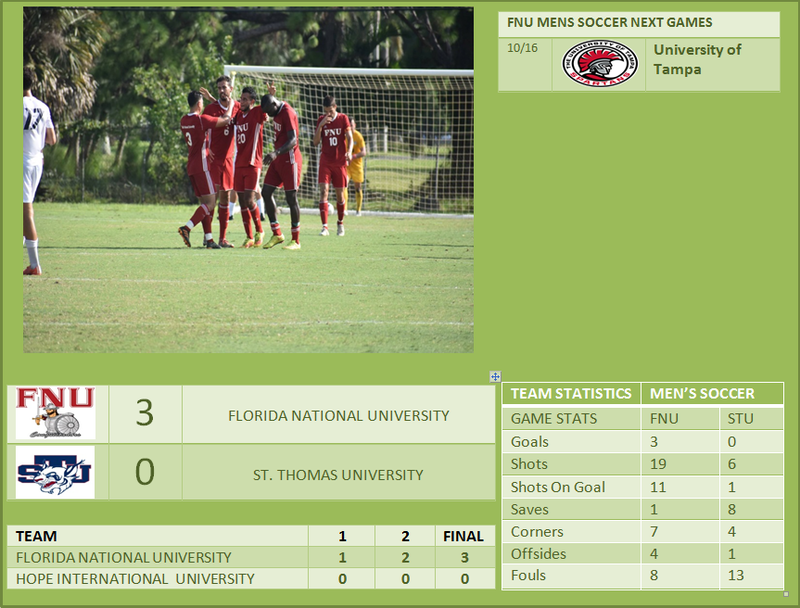 FNU scored two more goals in the second half with Pedro Veiga and Pedro Rocatti. Amazing away game from FNU Conquistadors where the conquistadors dominated over the Bobcats. This meeting was the third time contest between both programs, and the Conquistadors still Undefeated with 2-0-1 record. Third shutout in a row for Rodrigo Festuccia. UP NEXT: The Conquistadors next meeting will be the USCAA National Championship BID day, on Tuesday October 30th.